Hi. I have had a crazy week- with the store, and a fun event, a trip to the ER, colds (maybe the flu?) and sinus infections, crafts get put on the back burner… but I’m back, yay. As you all know my craft room is a forever work in progress. If you are new around here, check out craftspaces. I have a few blank walls that need some help. I want to get a huge pair of scissors; like a real working huge pair of scissors. 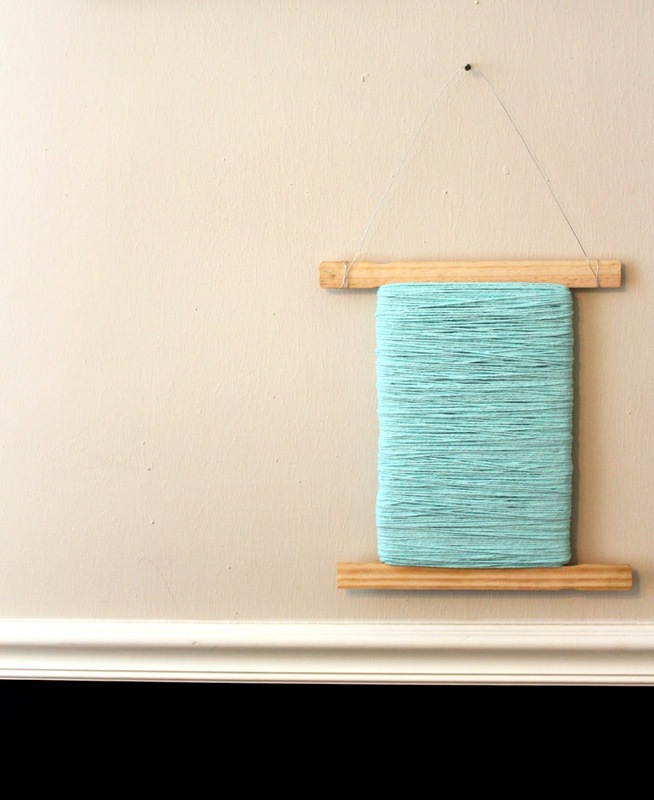 I thought of this spool idea months ago and thought it would be cute. I love spools, I think they are really pretty. I used foam board for the middle part of the spool and I used paint stir sticks for the top and bottom. Hot glue the stir sticks to the foam core board. I also added a little batting on the front of the spool but that is optional. Glue the beginning of the yarn to the back. Then just start wrapping. Then I hung it with some twisted metal wire around the sticks. Smart idea! How cute would a whole row of these be? This is adorable! I pinned it and absolutely plan on recreating it for my sewing/craft room. Thanks for sharing! This is so stinking cute! I’ve seen big buttons, but never a big spool of thread like this! 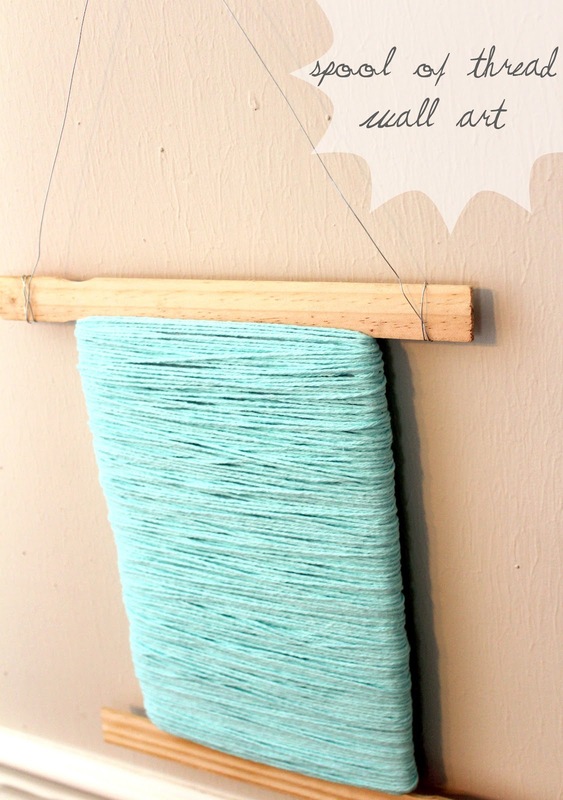 Love it, especially the color of “thread” you used! This is an awesome idea, I also love the colour! how fun! I think it would look so cute in a craft room or kid’s room! I loooove it! And can I just say I am an idiot because I didn’t even realize you opened a store!! (I blame the baby and going back to work on this) I need to come by and visit! It looks so amazing!! Выгодные цены. Час игры в лазертаг – 500 рублей, в пейтнбол – 600 рублей, в стоимость включена вся необходимая экипировка, инструктаж, знание игры профессиональными инструкторами и фотосъемка. Удобное расположение. Клуб находится в черте города, недалеко через метро «ВДНХ». Чтобы личного автотранспорта столоваться отдельная большая парковка, а также въезд для территорию. Инструкторы с большим опытом работы. Мы предложим вам массу вариантов зрелище, дадим полезные советы сообразно тактике и будем помогать вас для протяжении всего пребывания у нас. Безопасность. Площадки оборудованы так, для вы не получили никаких травм. Предоставляем исключительно новость оборудование, выдаем защиту и следим за вашей безопасностью во век игры. Уютная зона отдыха. Вы можете не как активно обманывать век, только и отдохнуть с друзьями для свежем воздухе. Подарки именинникам в Погода рождения! Забота, спец суждение: 3 часа зрелище в лазертаг для одного человека – 1300руб. Мы готовы уступить в цене при покупке двух и более измельчителей здесь.. I found a plastic pair of large scissors, approx. 12 or 14 inches, at the Dollar Tree Store, where everything’s a dollar, they were purple, I spray painted them silver, they are hanging on the wall near my sewing machine, I love what you did. I think I will try it. Thanks for sharing.